Visit us at our new store front! Check out our food truck schedules on social media to see exactly where you can taste what everyone's talking about! 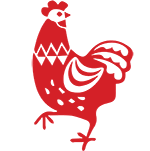 Bring the Roaming Roosters to your next party or special event! Roaming Roosters’ recipes are sure to spark an appetite in every lover of fried chicken! See what we're serving.